On the heels of its hottest year for sport-utility vehicle sales, Ford unveiled a new 2019 Edge SUV with an aggressive cosmetic and technology overhaul. The company outfitted the new Edge with a standard 2-liter engine with slightly improved performance and fuel economy than its predecessor. 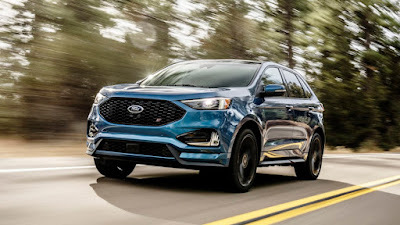 Also new to the lineup: the 2019 Ford Edge ST, a new performance variant. Ford is expected to show off the new models at the Detroit auto show next week. 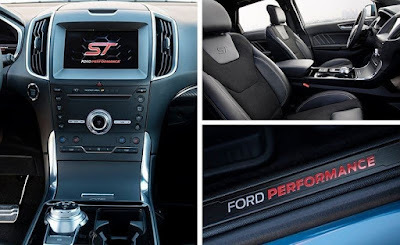 The standard Edge gets an 8-speed automatic transmission, a stop-start engine, LED headlights, a wireless charging pad and standard four-wheel drive. The vehicle has WiFi capability for up to 10 devices. Drivers can use a smartphone to lock, unlock, remotely start and locate the Edge. In addition, the vehicle allows consumers to check details such as tire pressure and fuel status from home. Available safety features include an automated system that helps the driver evade accidents, using a radar and camera. It also has adaptive cruise control with a system that helps keep the vehicle centered in its lane. Ford also plans to offer an Edge ST variant, marking the first time the company has attached the performance label to an SUV. The 2019 Edge ST will get a 2.7-liter twin-turbocharged engine with 335 horsepower. Other ST features include better handling, braking, suspension and engine performance. Owners of the Edge generally aren't weekend warriors and don’t have multiple vehicles, said Jonathan Crocker, vehicle engineering manager.